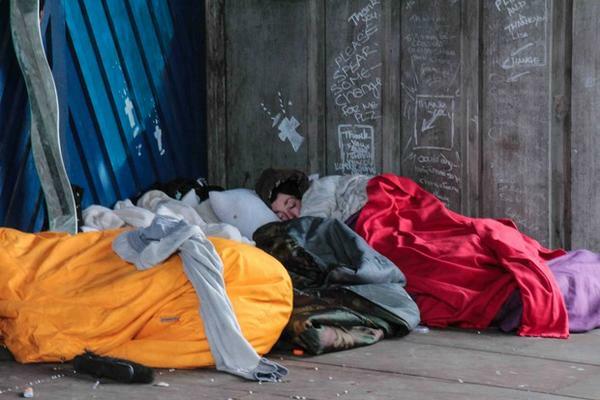 88 people who were homeless died in Multnomah County last year. That compares to 30 - just three years ago. Republican gubernatorial candidate Knute Buehler outlined his vision Monday in Portland to get people without shelter off the streets. He said his plan would end unsheltered homelessness in Oregon in the next five years. Standing in front of a fountain in Portland’s Old Town neighborhood, Buehler also said if elected he would hire a chief homeless solutions officer. “After the election and before I’m sworn in, in December, I’ll convene a statewide summit to listen and gather the best ideas for solving this crisis," Buehler said. Buehler said he would commit $10 million for 8,000 temporary and long-term beds to get people without housing off the streets. Under his plan, Buehler would "push state and local governments to pursue 'all of the above' housing strategies" and fast track 20,000 new housing units that include things like multi-family apartments and tiny homes. In recent years, Buehler has voted against bills to force affordable housing. In 2016, he voted against Senate Bill 1533, which gave cities the ability to enact Inclusionary Zoning. Last year, Buehler voted against House Bill 2004, a failed effort that would have allowed cities to implement rent control. Alison McIntosh, deputy director at Neighborhood Partnerships, a Portland-based housing nonprofit, put out a statement following Buehler's announcement. She said the state has a record number of students experiencing homelessness. "Families who used to have roofs over their heads, paid their rents and followed the rules are living in shelters, on the streets, and in their cars because in Oregon it is still legal for landlords to kick people out of their homes for no cause," McIntosh said. "We are calling on all candidates and elected officials to put an end to no-cause evictions and create a plan to deal with out-of-control rent increases." OPB's Dirk VanderHart contributed reporting.